10x GC-rich Enhancer is used as PCR additive for difficult GC-rich templates. The optimized solution modifies melting behaviour of nucleic acids and often enhances amplification of suboptimal PCR systems with high degree of secondary structures and GC-rich regions. 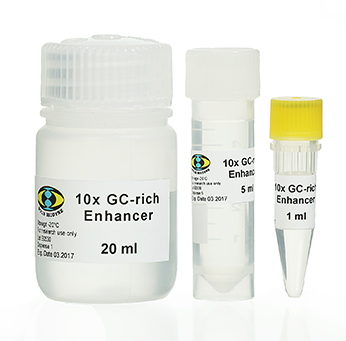 10x GC-rich Enhancer should be used at a defined working concentration (1x, 2x or 3x solution) and only if non-specific amplification occurs. 05-16-00010 1 ml 10 x PDF PDF 5 EUR Login to buy! 05-16-00050 5 ml 10 x PDF PDF 20 EUR Login to buy! 05-16-00200 20 ml 10 x PDF PDF 60 EUR Login to buy!